This article explains how to install Macrium Reflect on a PC that isn't connected to the Internet. For information on installing on an Internet connected PC please see here. Validation of your license during installation. This article refers to the machine you wish to install Reflect on as the "target PC" and the machine connected to the internet as the "online PC". You will need access to a computer that is connected to the Internet and a device to copy files to the target PC. 1. Download the installer and PE components. 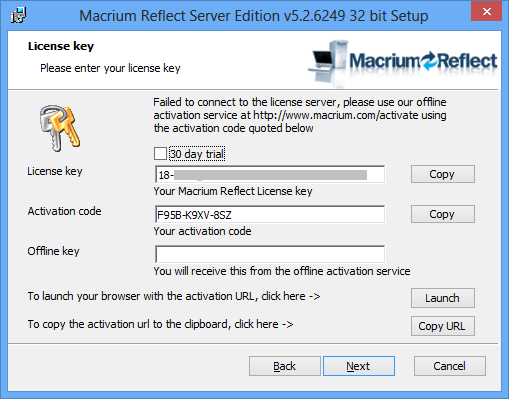 Download the Macrium Reflect Download Agent on your online PC and run it. Select Trial and choose the edition or select Full and enter your key. The download agent is automatically configured for the computer it is running on. You will need to reconfigure it to reflect your target PC instead. Do this by clicking the Options button. Choose the download architecture for your offline PC. See the "How to identify the architecture of your target machine" at the end of this article. 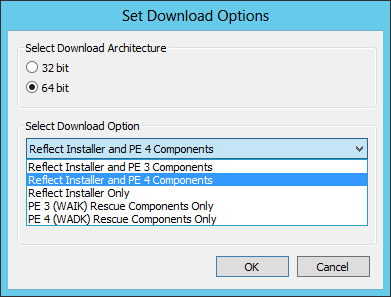 Choose the installer and PE component. 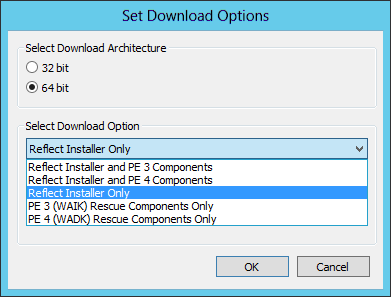 E.g, "Reflect installer and PE 4 components" if your target machine is running windows 8, otherwise "Reflect installer and PE 3 components"
Click OK, then un-check "Run installer directly after downloading", and Click download. The file names will vary dependent on your particular selections. There will be an installer .exe file and a PE components zip file. Copy these two files to your target PC and run the installer ensuring that the zip file is in the same folder. You will then be able to install your software and generate PE rescue CDs. 2. Offline installation of your purchased license. Note: This step is not necessary for the Free or Trial Editions of Macrium Reflect. When you run the installer on your target PC, instead of the automatic activation, you will be given an activation code. F95B-K9XV-8SZ in the example below. 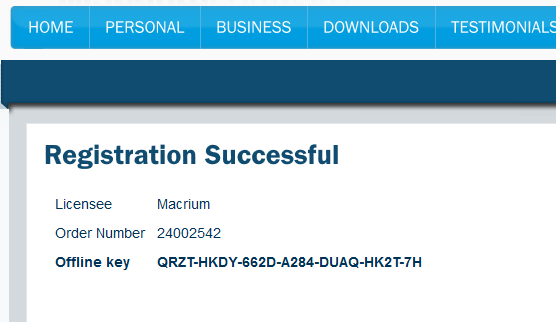 Navigate to the registration server on your online PC and enter your license key and activation code. 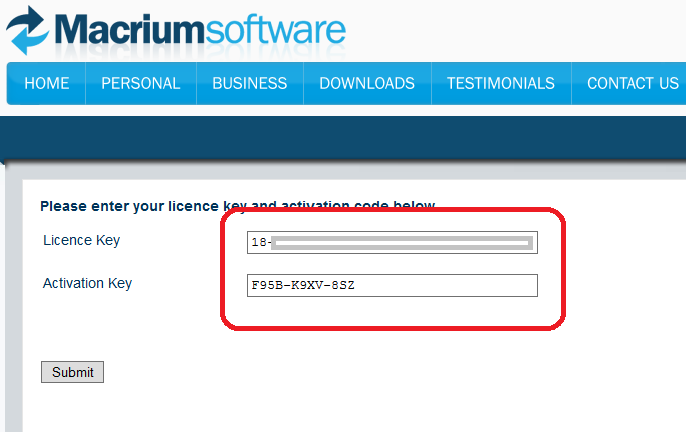 Click 'Submit' and you will receive an offline key as shown below. Enter the Offline key in the install dialog to complete installation. 3. Ensuring your software is up to date. Note: For online installations, update notifications and patching is automatic. Check the change log web page periodically for updates. If you see an update that is relevant to your system, follow the steps in 1. above, but choose the 'Reflect Installer' option in the download agent. How to identify the architecture of your target machine. Run msinfo32 (type Windows Key + R and then type msinfo32) and note the system type. x86-based PC indicates that the target machine is 32 bit and x64-based PC indicates a 64bit system. Article has been viewed 38,129 times.